Jeff "Gussy" Gustafson is not only one of the best-known fishing guides living in Sunset Country, he is also one of just a handful of Canadians fishing the FLW Bass Tour in the United States. Anyone who knows Jeff is aware of his skills when it comes to catching bass. These skills have been developed over many years fishing mostly on the Canadian Shield Lakes in Ontario's Sunset Country. Up here, smallmouth bass is the dominant species but several lakes also offer a chance at largemouth bass, which grow larger than the smallies. Many a bass tournament has been won by competitors who can find where the largemouth are. Saying that we do have our share of 5 and 6-pound smallmouth so that's something to get excited about! Jeff was kind enough to take time out of his busy schedule and sit down with Sunset Country Executive Director Gerry Cariou to share his knowledge about fishing for bass and if you're a bass angler, take note of these suggestions as they will definitely increase your chances at catching more and bigger fish up here. Jeff showing off his bass fishing prowess with a football-sized smallmouth bass caught just before sunset! Sunset Country: Thanks for taking the time to do this Jeff! So let's talk structure first. There are so many locations on these Shield lakes up here that offer anglers varying structure - rocky flats, humps and saddles, weeds - what advice can you give visiting anglers on how to read structure and how do bass relate to structure at different times of the year? Jeff: No problem Gerry, always happy to talk bass fishing. As to your question about lake structure you're right, there are many different types that you can fish in Sunset Country. As a general rule, I fish shallow water during the spring and for most of the summer months. That includes weedy back bays and rocky shoreline structure and I usually do well on both. When the water starts to cool down in late-August is when I will start to look a little deeper and jig for bass - for example, using a favourite bait of mine - a tube jig. I also look at the weather patterns and when a cold front has moved in, I almost always go deeper - at least for the smallmouth. I like shallow water in the late spring and summer because it allows me to use my arsenal of top-water baits. There's nothing like catching bass at the surface - the strike is the most fun part and I usually use a bait like a popper. If it's really a windy day, I may go to a spinnerbait or start to jig for them, again, usually using a tube jig. Sunset Country: You're well aware that there are a lot of bass tournaments in Sunset Country - both big and small - what advice would you give to anglers fishing under these "high pressure" conditions where prize money is on the line? Jeff: You're right, there is a lot of pressure on anglers - mostly self-induced mind you - when fishing in a tournament. The best advice I could give here (and something I follow to the letter) is to fish for the big fish as opposed to trying to catch a lot of bass and hoping for a few lunkers. So when I fish in a tournament, I like to use a larger-sized top-water lure and I fish it slow on specific kinds of structure. By this I mean I look for places where the big bass like to hide. This includes around docks, at the end of a rocky point or where pencil reeds emerge along a defined break in water depth. You'll often find the bigger bass in these kinds of locations. 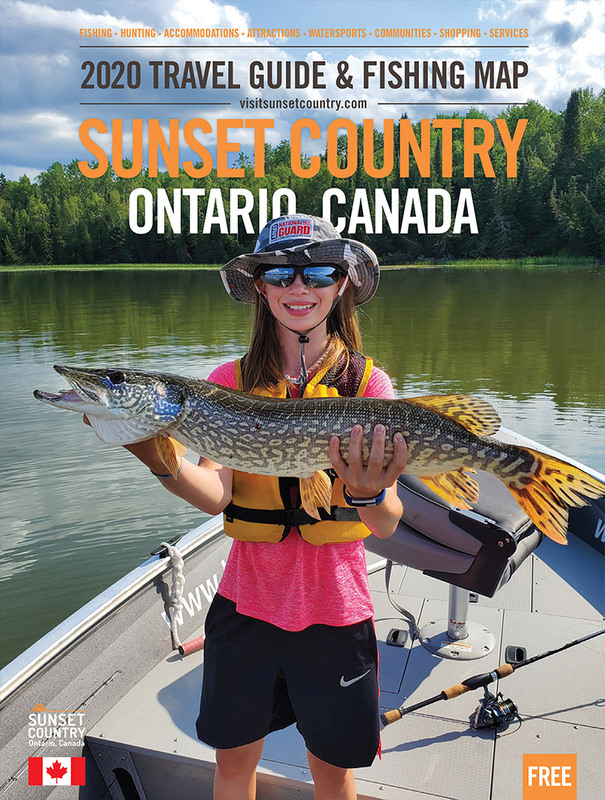 Sunset Country: In Ontario's Sunset Country most lakes with bass harbour smallmouth bass but there are several lakes with largemouth bass in them. I know many a bass tournament has been won by anglers who catch the largemouth bass given their average size is usually bigger than smallies. What tips can you provide our readers with regarding finding and catching the largemouth bass? Jeff: With largemouth, I almost always look to find them in or around weed beds or structure like dead-heads, docks or fallen trees. I usually target largemouth bass with baits like a top-water frog which I cast into the weed beds or a "Senko" which also helps reduce problems with weeds fouling the line. Under the right conditions, I will sometimes use a spinnerbait. Gussy nails a hungry bass while fishing tight to the shoreline ! Sunset Country: There's a lot of gear choices out there Jeff, any tips for our readers? Jeff: I would say for most bass anglers, and especially those travelling a long distance to fish in Canada, they should keep things simple. You don't need a huge selection of rods or reels. I'd say a spinning rod/reel set-up is best for jigging and a bait casting set-up is best for accurate casting. Make sure you have a GPS so you can mark spots and so you return safely. As to tackle well there is an endless choice so my best advice here would be to have a variety of baits - some top-water stuff, small crank or spinning baits and plastics. Again, I like Senko plastics the best and definitely bring tube jigs and tubes for when it's time to switch to jigging. Sunset Country: Most bass anglers have experienced the "worn out spot" syndrome where a particular location performs well and produces several bass then suddenly shuts down. When this happens what do you do? Jeff: Instead of trying a bunch of other presentations, I usually decide to move and to keep moving until I find a fresh spot. Often when a spot goes dead on me I will move to a location that is windswept to see if the wave action is making the bass active and I will usually change my technique in the sense of slowing things down and use baits I can work slower. I will also switch to topwater baits on occasion because you just never know. Sunset Country: Jeff in Sunset Country there are 70,000 lakes - from clear, deep trout lakes to tea-stained waters. How should an angler approach fishing for bass in a clear trout lake versus darker water? Jeff: That's a good question since you can find bass in so many lakes up here. When I'm fishing a trout lake I try to fish with more finesse and I always use a lighter line. I will target deeper points and reefs in these lakes or where a waterfall or creek is flowing in and let the current bring my bait to the fish. I also look for spots with cabbage grass on the clear lakes, it almost always holds a nice bass. On tea-stained lakes, I will fish shallow basically all the time and I am always casting to natural ambush spots where there's a good chance a bass is hiding. Sunset Country: Do you have any tips for readers about the proper handling of bass? Jeff: Bass are hardy fish but you should still handle them carefully and release them as soon as possible. The thing I don't like seeing is bass on the floor or carpet of a boat, too easy for the fish to get an abrasion. I know some people say otherwise but it is okay to hold a bass vertically up here. A 3-pound bass in sunset country is around 12 years old so they grow slower but live longer than bass further south. Obviously, if the water and air temps are warm they will stress more easily so you should release them as quickly as possible. Sunset Country: You' have always been a great ambassador for and a big supporter of the tourism industry in Ontario's Sunset Country. Why should people travel here to fish for bass? Jeff: Tourism is a key part of the economy across the entire region where I'm from and it's for a good reason - the quality of fishing is off the charts here. When I speak to people in the USA and especially those in the deep south I tell them they can escape the heat and experience what I think is one of the best, relatively undiscovered regions in North America for smallmouth bass fishing. The scenery is also incredible and the sheer number of lakes, quality lodging and friendly people make it a trip everyone should take. Sunset Country: Thanks for taking the time for this interview Jeff! A typical day's tournament catch for Jeff!